Nevis is located in the northern part of the eastern Caribbean and is more popularly known for its sun, sea and sand. However, since the legislation that allows for captive insurance companies to be domiciled in Nevis was passed in 2004, the jurisdiction has experienced noticeable growth in captive insurers using the jurisdiction as their domicile. Nevis is now increasingly known for its responsive, regulatory appropriateness and efficient handling of its international insurance operations. At the end of 2005 the jurisdiction had already registered fifty four (54) captives and by the end of 2012 approximately two hundred and thirty (230) captives. It must be noted that Nevis can be considered a domicile where most of the captives may be defined as micro captives that are based on the use the Inland Revenue Service (IRS) S. 953 (d) electives. These micro captives are utilized by families, professionals and small business owners who use the captive to supplement existing traditional policies. This market is price sensitive and Nevis is well placed to facilitate such business. Accordingly, the average total annual premiums of the captives are approximately US$2 million which is deemed small as compared to other jurisdictions. Considering that the jurisdiction’s niche is in micro captives the associated risks are low and the corresponding regulatory framework is in place to ensure that stringent yet appropriate due diligence requirements are in place for new and ongoing business. As such the relevant insurance legislation provides proper regulatory framework for the operation of these captives. It must be noted that an important aim of regulation is to ensure that legitimate business access financial services and Nevis as a jurisdiction is cognizant of this principle and ensures its facilitation. Parallel to the jurisdiction being favoured by micro captives it follows that the fee structure that these captives are subjected to are in line with the size of such captives – small. This ensures that these family owned professional or small business captives are able to access cost efficient financial services that meet international standards. A captive insurance company regardless of the size is a valuable asset to its owners. The quality of the jurisdiction is manifested through the number of quality service providers that offer a range of financial services associated with captive management. Some of the island’s service providers are internationally established with operations in other jurisdictions. These service providers have recognized the opportunity that Nevis presents in captives and have opted to utilize such for the benefit of their clients. These service providers possess valuable experience and skill and have access to networking capability to connect with equally experienced and skilled professionals to support them to ensure the objectives of the captives are met. Also Nevis as a captive domicile has an approachable regulatory body that remains open for discussions with all stakeholders. 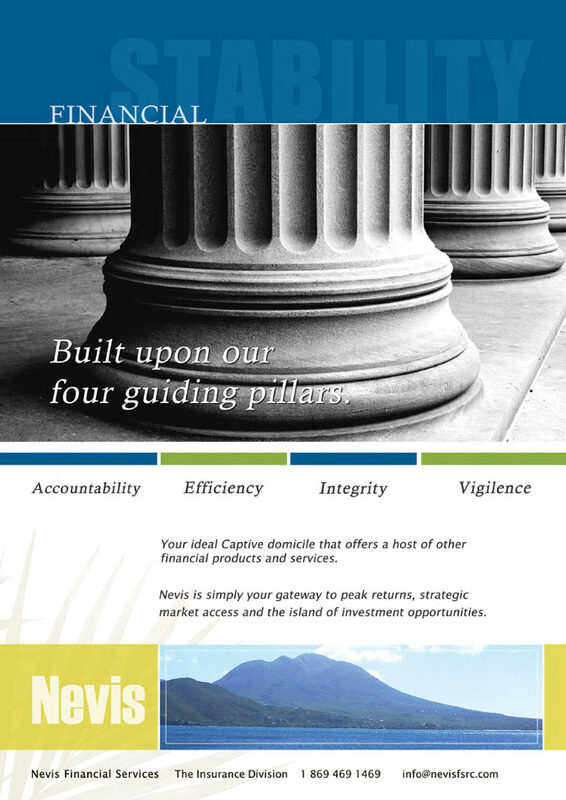 The Nevis Financial Services Department and in particular the insurance supervision division facilitates open discussions that encourages the bilateral flow of information between all interested parties. This work ethic lays the foundation for meaningful, positive and mutually beneficial relationships between service providers, licensees, other country regulatory agencies and international organizations concerned with financial services. It is the belief that in such a dynamic industry the need for clear and frequent communication is paramount in ensuring the regulatory process continues to be relevant and effective. Similar to Nevis as a travel destination, Nevis as a captive jurisdiction is relatively a hidden gem. However, once it is found becomes treasured by those who utilize the jurisdiction’s services. Nevis as a captive jurisdiction reflects its value through its continued growth in captive registration at a steady pace with a high percentage of retention.